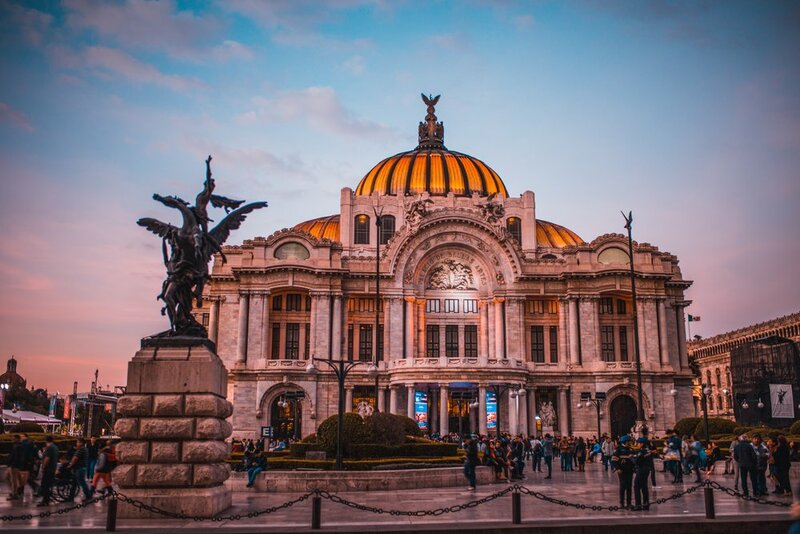 Starting in Mexico City, this comprehensive tour covers much of the great land of Mexico. The tour encompasses great archaeological sites such as Chichén Itzá, natural beauty such as the Blue Water Waterfalls and cultural highlights such as the baroque Santo Domingo church. The tour finishes at Riviera Maya overlooking the Caribbean Sea. Departure dates: 9/Feb, 23/Feb, 9/Mar, 23/Mar, 6/Apr, 27/Apr, 11/May, 25/May, 8/Jun, 22/Jun, 6/Jul, 20/Jul, 3/Aug, 17/Aug, 7/Sep, 21/Sep, 5/Oct, 19/Oct, 2/Nov, 16/Nov. Arrive at Mexico City International Airport and transfer to the five-star hotel Barceló México Reforma. After breakfast, enjoy a city tour, taking in the Constitution Plaza, known as Zócalo, which is surrounded by beautiful baroque buildings, including the Cathedral. The National Palace is the headquarters of the president of Mexico and here visitors can admire the murals painted by Diego Rivera. A major attraction is the Templo Mayor, the great temple of the Aztec capital. There is a stop at the Guadalupe Shrine then the tour continues to Teotihuacán, named by the Aztecs as “the place where the Gods are born”. This location includes three great edifices: the Pyramid of the Sun, the Pyramid of the Moon and the Citadel. After an enjoyable lunch stop, return to Mexico City. Travel by bus to the beautiful colonial city of Puebla. Visit the Santo Domingo church, including the Rosario Chapel, one of the biggest works of Mexican baroque art. After a restaurant lunch, the tour continues to Oaxaca. Stay at the 4-star Holiday Inn Express Hotel or similar. In the morning, visit the famous archaeological site of Monte Alban, a ceremonial centre built on a hill rich in pyramids, tombs and sunken reliefs. Visit a typical “alebrije” workshop. These are brightly coloured Mexican folk art sculptures. In the afternoon, return to Oaxaca and visit the “Patriots’ Cradle”, then continue to old Santa Catalina from Siena friary and to the local market, one of the most typical of the region. In the morning, depart for Mitla, an ancient Mixtec centre. Visit the archaeological site, that was used by Mixtecan for their ceremonies with its the distinctive geometrical decorations. The tour continues to Tehuantepec for lunch. In the afternoon, drive to Tuxtla Gutiérrez, capital of the state of Chiapas and stay at the 4-star Marriott Hotel or similar. Transfer to the Cahuaré wharf to enjoy a launch boat trip through the Sumidero Canyon. The altitude and the beauty of the place create an unforgettable experience. After lunch at a local restaurant, continue to San Cristóbal de las Casas. to stay at the 4-star hotel Villa Mercedes San Cristobal or similar. In the morning, visit a typical local market, where hundreds of indigenous people sell their hand-made products every day. The tour continues to the baroque Santo Domingo church, founded in 1547, after which visitors can meet the indigenous communities of San Juan Chamula and Zinacantán. The San Juan Chamula community is particularly linked to this church, where ceremonies had a strong pagan influence. By contrast, the indigenous population of Zinacantan is very loyal to the Catholic faith. Learn how to make and then enjoy a delicious authentic tortilla and try a shot of pox, an ancient Mayan elixir. Transfer to Cancun International airport. Overnight stay in the hotels listed or similar, American breakfast each day (except first), 8 lunches, restaurant fees and tips, all-inclusive treatment at the hotel Barcelò Maya Beach, transportation in 10-seat van, microbus or autobus, with air conditioning and sound system, English-Italian or English-Spanish speaking guides from days 1 to 6 and from days 6 to 11, entry to the archaeological sites and museums mentioned in the programme, porter service in airports and hotels.